The Mockiwi (マッキー?) is an enemy found in Hey! Pikmin, and a member of the mockiwi family. It is a round, bird-like creature with a yellow body, a short, wide beak, large brown eyes, and two small vestigial wings. Based on the official Hey! Pikmin game art, they are almost completely covered in small, hair-like feathers. The Mockiwi are aggressive creatures that will attack Pikmin on sight. They mainly patrol a set path, making clucking sounds as they move about. When they spot Pikmin or Captain Olimar, they will give chase. They can also be found sleeping, and will begin to patrol once they have been awakened. Mockiwi can also emerge from holes in walls. These Mockiwi will continue to appear after the previous is killed. Mockiwi cannot swim and will drown if they fall into water. Mockiwi will not follow the player should they climb onto a ledge, despite seemingly being tall enough to scale most ledges. They will instead watch the player, screech and snarl, and then walk away. To do: List all locations. Artwork of Pikmin fighting a Mockiwi. 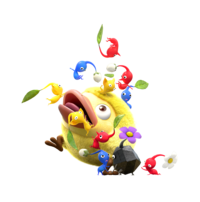 Mockiwi may be large, but they can easily be taken out with any Pikmin type: simply throw Pikmin onto their backs to kill them. Mockiwi drop 2 Sparklium upon death. Mockiwi will not be able to turn around if the player hits them quickly enough. This can be exploited to take them out without losing any Pikmin. To avoid fighting the Mockiwi when you have no Pikmin, use the jetpack to fly over it. Olimar will touch the creature as he flies by, but will not interact with it or be damaged. A Mockiwi coming out from a hole. A Mockiwi being woken up. A Mockiwi yawning after waking up. A Mockiwi in the creature log. This page was last edited on April 15, 2019, at 16:01.